← Rookie Hazing: Colorado Rockies in Speedos! 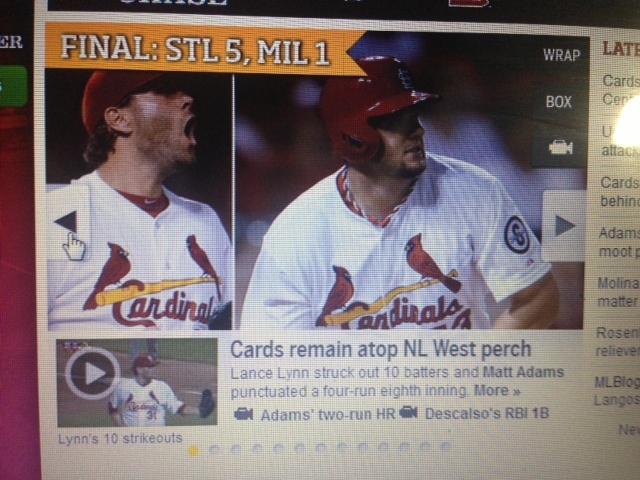 After the St. Louis Cardinals 5-1 victory over the Milwaukee Brewers Wednesday night at Busch Stadium, the Cardinals website proclaimed “Cards remain atop NL West perch.” While it’s true that the Redbirds are in first place, they are in the National League Central. This entry was posted in LOL, National League, St. Louis Cardinals and tagged Baseball, Busch Stadium, Cardinals, Funny photo, Funny Picture, LOL, Major League Baseball, Milwaukee Brewers, MLB, National League Central, National League West, Redbirds, St. Louis, St. Louis Cardinals. Bookmark the permalink.